Welcome to the original Cheese Making Course Online! A few years ago, we made the commitment to step out in faith and live our life in a manner consistent with our beliefs. After a lengthy search, we found a house on some acreage that would allow us to put our plans into practice. Shortly after we moved in, we purchased our first dairy cow. Neither of us had grown up on a farm so, we thought, what business did we have caring for a cow? Well, all is well, and we are excited to share our experience with you. The first thing people ask us when they find out we have cows is “How much milk do you get each day?” Several gallons we reply. Which is quickly followed by “What do you do with all that milk?” Good question. We make cheese! As a matter of fact, we have learned to make delicious cheese at home. Actually, I should clarify one thing right now in order to keep my marriage in tact, my darling wife Melissa is the cheese maker at our farm. My job is chief cheese taster. I know, it’s a tough job, but someone has to do it. So, if you have ever wanted to learn how to make cheese and you don’t have the time or resources to travel to remote locations around the globe, then read on. We have documented our experience and created a short online video series based on our in-home class and the terrific feedback from our cheese loving students. When asked about pursuing hobbies and interests, most people comment that they would love to if they only had the time, extra money or space. Life is too short to dismiss these desires. We too often limit our thinking. The joy of pursuing a hobby or interest can only be understood by taking action. It’s in the process of learning itself that adds color to our lives. So, be encouraged. You will get the help you need along the way by stepping out in faith. Go for it! Our family has been changing how we do things for several years. Organic and raw foods, environmental influences, preventative health, discarding pharmaceuticals, gardening, buying local, etc. It’s a lifestyle really. Realize that we didn’t make these changes overnight, however we saw rewards early on and we continue to get confirmations along the way. The biggest challenge is finding a reliable source of information to guide us through the process. Kind of like parenting. We’ve had to be resourceful to find the answers along the way. We ordered a book from Amazon on caring for a family cow. Very informative. Actually, it was sobering. We thought, what are we getting ourselves into? The book is a good resource; however it’s no substitute for taking action. Making cheese is the same way. And there’s nothing like being forced to pour gallons of unused delicious, beautiful, farm fresh milk down the drain to push you into action. So, Melissa went to her good friend Lori and asked if she would teach her to make cheese. Lori, bless her heart, said “Sure, here’s a book.” And then sent Melissa on her way. In her defense, Lori has been a tremendous help and totally supportive. A true friend. Besides, she has seven children and limited time to hold Melissa’s hand through the cheese making process. After many attempts, some successful, some not-so-successful, Melissa learned to consistently produce very tasty cheeses. As a result, we are treated to Farm House Cheddar, Garlic Pepper Jack, Cottage, Colby, Mozzarella, Ricotta and other cheeses on a regular basis. It’s been said that to really master something, then teach others. It takes your knowledge to the next level. It also raises your confidence and encourages you to share your experience with others. Thank you so much for a delightful, educational day! It was wonderful meeting you both and I’m happy to report that my ricotta turned out great, even though I made a boo boo and didn’t ladle the curds out of the whey. Thanks again for establishing my baseline cheesemaking knowledge. Let’s dispel a common myth. Making cheese at home is too expensive and requires costly equipment. Wrong. Most people already have the majority of kitchen tools necessary to produce cheese and what you don’t have you most likely can borrow from a friend. Even if you were starting from scratch, for less than a $100 dollars, you could equip yourself adequately to make cheese on a regular basis. The art of cheese making requires a small investment of time, and with our online video course, only a nominal investment in money. How many hobbies can you learn the entire process, with step-by-step video and written instruction for only $19.95 complete? We leave nothing out. We even include simple plans to make your own cheese press for less than $15 in supplies. This is the exact same cheese press that we use for making our hard cheeses. You’ll save over $200 just on the cheese press alone. Most professional cheese presses start at $250! Before You Make Cheese: How to prepare your kitchen/workspace. The proper use of a bleach solution to clean your food preparation surface. Adding Starter and Rennet: How to properly “ripen” the milk and identify the correct firmness of the milk as it sets up. How to determine the correct measurement when adding rennet. Too little rennet and the milk won’t set properly. Too much rennet and the resulting cheese will be rubbery and bitter tasting. Cutting The Curds: How to properly cut the cheese curds to avoid losing necessary butterfat. Our video instruction shows you how to confidently cut curds with damaging the curds. Heating The Curds: How to gradually bring the curds up to temperature to avoid the curds trapping too much moisture. Milling The Curds: How to properly break up the cheese curds to prepare them for the molding process. Molding The Cheese: How to correctly use the cheesecloth as a liner for the cheese mold and how to pack the curds into the mold. Pressing The Cheese: How to properly apply pressure to the cheese gradually to avoid losing required butterfat. As a special bonus, we give you the plans to easily construct your own cheese press for less than $15 in materials. It’s the same cheese press we use for our cheese making and it works great! Air Drying: How to correctly develop the rind for your new cheese. No, you can’t eat it yet…be patient! Waxing The Cheese: How to properly wax your cheese for the remainder of the aging process. Includes special tips on cooling the cheese prior to waxing. Aging The Cheese: It is recommended to allow the cheese to age or ripen for at least 50 days, especially if you are using raw milk for your cheese. We teach you how to age your cheese properly using your existing refrigerator. As we add recipes and videos in the future, you will receive access to those automatically as one of our paid students. No additional course fees or charges ever! Everything is included for one low, low price. Only $19.95! Learning how to make cheese is not difficult, unless you make it difficult. Watch the videos, take notes, have fun and follow the instructions. You’ll do great! Soon, you’ll be enjoying your own homemade artisan cheeses. Once you purchase your course, be sure to print out the list of materials needed for your cheese making efforts. Order any required supplies from our own list of online suppliers and get ready to make your very first cheese! Several of our in-home students have commented to us that we should charge at least the $85 that they paid for the exact same course. They have a point, however we are committed to making this affordable to anyone looking to make their own cheese. So, take advantage of this one-time low price to get access to your fun and exciting cheese making course before we come to our senses and raise the price. 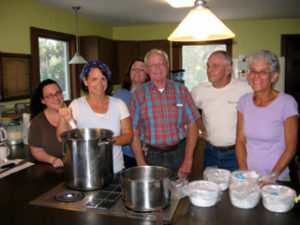 What Do You Get With The Online Cheese Making Course? Sign up for the Cheese Making course right here. Once your payment is accepted, you will be given immediate access to the online course, bonuses and resource materials. Pay with confidence using PayPal.